I thought this mundane little tidbit of history might be a nice break from some of our traditional nitpicking over Imago Dei, John Locke, natural religion, Theistic Rationalism, yadda, yadda, yadda. 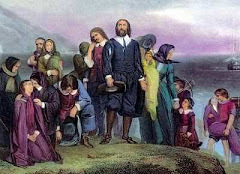 The evening of March 5, 1770 was like any other evening in colonial America...well...almost. As young Private Hugh White of the British Colonial 14th Regiment took his post in front of Boston's custom house, one wonders if he sensed the impending doom that would shortly come. As the evening progressed, young Private White was met by his superior, Captain John Goldfinch, and the two men "exchanged in pleasant conversation." The conversation was to be interrupted, however, by the intrusion of a young local apprentice named Edward Garrick. Garrick accused the soldiers of several misdeeds, all of which were ignored by the British soldiers. Angry that his accusations were being swept aside, Garrick attacked the men through obscenity, calling the British soldiers, "a bunch of damned lobsterbacks." This insult was apparently sufficient provocation to cause Private White to strike Garrick on his head with the stock of his musket. Upon seeing and hearing this altercation, scores of Boston citizens rallied to defend the young Garrick. 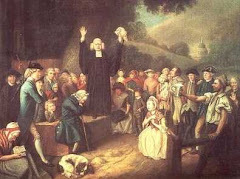 As we all know, tensions were high to begin with, and the people of Boston did not need much provocation to start a riot. In literally minutes, the crowd gathered to roughly 300. Seeing the possibility of a riot, Captain Thomas Preston sent reinforcements to help support Private White and the other soldiers present. The crowd had already surrounded white, backing him up all the way to the customs door. 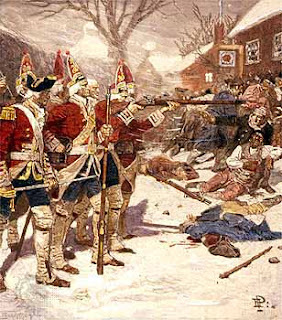 As the other British soldiers arrived to help White, several were knocked down by the crowd, which caused the British soldiers to fix bayonets. As the crowd continued to grow, more and more Bostonians joined in the chorus of obscenity that was directed to the British. Chants of "damned lobsterbelly" and "fight you wretched, damned lobsterbacks" brought the level of tension to its ultimate crescendo. As the snowballs, oysters, and insults continued to be hurled at the British (who were, quite frankly, having a very difficult time getting organized), several soldiers began to point their muskets at the crowd. This new sign of force caused even more snowballs to fly, and harsher insults to be shouted. Seventeen-year-old Samuel Maverick dared the soldiers to do their worst. "Come on and fire you damned lobsterback!" The rest of the crowd also joined in, yelling "Fire, Fire, FIRE!!!" As we all know (even though the specifics are greatly debated), the British fired into the crowd, striking 11 random people. 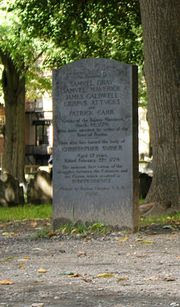 Young Samuel Maverick was instantly killed, along with four other Bostonians. In the weeks after the Boston Massacre several of young Samuel Maverick's closest friends decided to join the movement for revolution. Many of them joined the army as soon as possible (most of them were under the age of 16). When asked why he had joined, the young William Greenwood (a friend of Samuel Maverick), stated "to kill those damned lobsterbacks." “Lobsterback” has been repeated so often by historians that the term has taken on a life of its own. I learned it in school, and if you Google it you’ll find it still is a standard Revolutionary War vocabulary word. But is it really a Revolutionary-era taunt? If you go to the standard references, such as the Oxford English Dictionary, you find that “lobster” has been used since 1643 as a slang term for English soldiers, originally said of Roundhead cuirassiers on account of their armor, not the color of their uniforms. Later it was transferred to other British soldiers with red uniforms. “Lobsterback” is not in the OED, Webster’s Second, The Century Dictionary and Cyclopedia, The Dictionary of American English, or The Dictionary of Americanisms. It is in Webster’s Third (1961). Partridge’s Dictionary of Slang and Unconventional English lists the first example of “lobster-back” in 1822, and says it is a variant on “lobster (soldier).” The Random House Historical Dictionary of American Slang lists the first example as “lobster-backed” in 1809 in a non-North American source, and gives the first American usage as Crockett’s Almanac in 1840 (You can read Mr. Bell's entire post by clicking here). So it looks like British soldiers may not have been provoked over the heckles of "lobsterback" after all. With that said, we can still rest assured that colonists were probably less-than-civil on the night of the Boston "Massacre" regardless of whether or not "lobsterback" was a part of their repertoire. Other aspects of the traditional tale to rethink— Pvt. Hugh White wasn’t a young recruit, but thirty years old. Edward Garrick didn’t insult the British army; he yelled about Capt. Goldfinch and his regiment because he thought that captain hadn’t paid a bill. And Samuel Maverick was near the back of the crowd, more a bystander than one of the men threatening the troops. Interesting, yet another of those lovely little tales in the national creation myth that turns out to be false. I've been reading Neil Oliver's work on Scottish History where he deals with the Scottish creation myths (Rob Roy, Braveheart, Jacobites, etc.). His opinion is that they help define the national character, but shouldn't be a total focus. In the book "George Washington's War", author Robert Leckie states on page 55 "They (British soldiers) were also vilified as "foreigners" and the soldiers derided as "lobsterbacks" - a reference to the bloody floggings with which the British army enforced its brutal discipline." I had never heard of this unusual explanation of the term "lobsterback" until reading this book. The typical explanation as you stated is that they were called this because of their red uniforms. Now it appears that neither explanation is correct since it looks like the term was never used by American patriots at all! "Mr. Jefferson I Know You are a Deist...Right?" Tempest at Dawn: Who Wrote the US Constitution?